Ohio High School Equivalence Diploma (formerly GED) Learning Support Study for your Ohio High School Equivalence Diploma on your time with the support of personal coaching as you need it. Students working to achieve their Ohio High School Equivalence Diploma now have a new option of preparing for the tests using online tools. Online support includes: an orientation to the program, regular contact with a coach, and personal tutoring, which can be arranged with one of our regular Ohio High School Equivalence Diploma class instructors as needed. 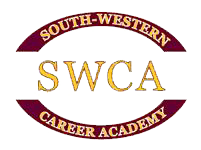 Students use Adult Basic Literacy online practice with personal coaching or with class instruction at the South-Western Career Academy. Advanced ESL students develop professional English skills meeting in small groups led by our Academic Online Coach. Students will practice English by sharing conversations about local culture and traditions while taking this online course. Limit: 10 persons Sessions: Classes are scheduled by appointment. Call to set up an orientation and scheduling appointment. Learn and practice English with other adults from around the world while singing folk songs from America and other countries! Basic choral training, history of the music, and language practice included. Participate in various college online courses of your choice with friends and coaching support. Universities around the world have made available select Massive Open Online Classes (MOOCs) which students of all ages can access for free or for a nominal charge. Learners can select coursework to improve an employment resumé, to prepare for college learning or to increase their understanding or skills in an area of interest. Research shows that students who take an online course, in a community with others, succeed at higher rates by meeting together once a week to discuss learning and complete assignments. Sessions and classes vary with student interest. Orientation: WEDNESDAY, Sept. 14 & Sept. 21, 7:30-8:30 p.m.
MOOC Cohort Sessions: Wednesdays, Sept. 28-Dec. 14, 4:30-6:15 or 6:30-8:30 p.m.